Many of us likely got a beautiful bouquet of flowers from our kids or partners to acknowledge their appreciation of us for Mother’s Day. But sadly, they will soon die and have to be thrown away. That's why I have put together these fun and crafty ways to save your flowers, with simple things around the house, so that you can continue to adore your loved one’s kind gesture. Pictured above are the only items you need to get through all 4 of our simple, fun craft ideas...are you ready!? 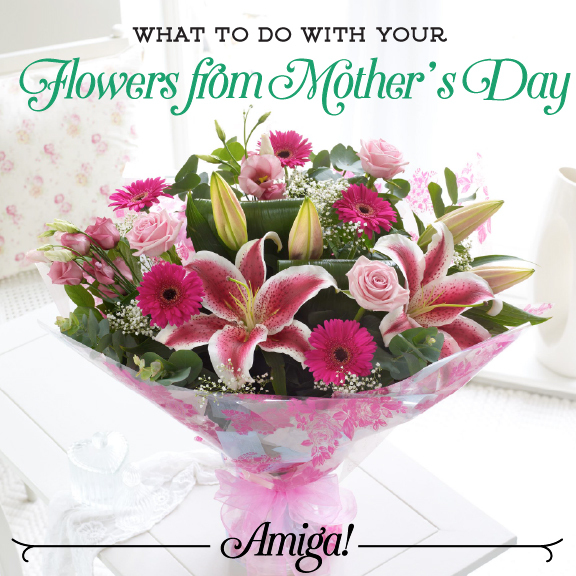 Lay your wax paper down and arrange the petals, leaves, and thin stems in a layout you like. Then fold the wax paper over (wax sides together) and at a low heat iron over the wax paper until it melts together and seals. You can then trim the wax paper to the size you prefer and add yarn on the top to give it a little extra style. You are going to melt a layer of wax over the petals. It’s best to do this with a candle that is a little soft. I left mine in the kitchen and worked on it after dinner so that it could soften up a little. When you have your arrangement planned out you are going to heat the inside of the spoon with the lighter and use the back of it to gently push in and around each petal and stem until it is coated with a light layer of wax. The pieces will be delicate so be sure to go over them very lightly. *This turned out to be my favorite! Make a design for your dish. 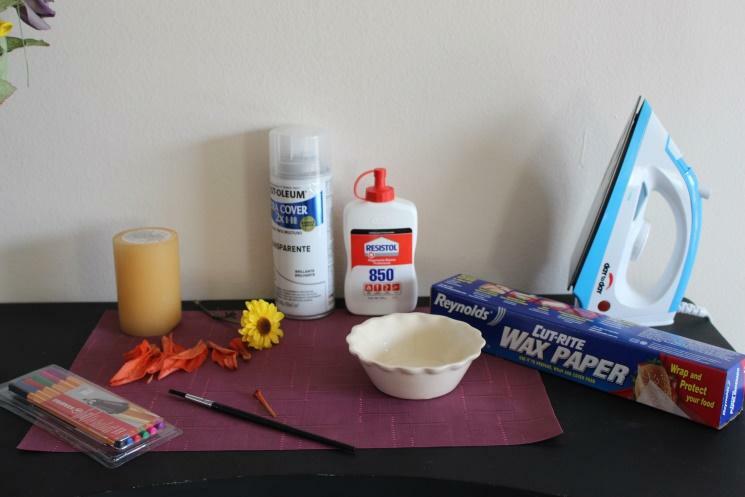 Take the petals that you want to use and put them over a towel, lay wax paper over the petals and gently go over the wax paper with an iron and the petals will become softer and easier to work with. Put a little glue on the paintbrush and lightly go over the petal. Place the pieces where you would like them on the dish. When you are done designing the dish go over the petal with the transparent spray paint. Make sure you go over your piece at a far distance or the air will move your pieces around. After it is dried you have a beautiful dish to use as decoration, a pen holder, a dish for “rings and things," candies or whatever you wish. There is always the trick of just simply drying the flowers out. The easiest way to dry your flowers is to tie a rubber band to the bottom of your bouquet and hang them upside down in a dry area of your house until they are completely dried out. It takes about a week to dry the flowers out completely. After they are dried you can add fragrance to them and create a potpourri, or leave them as is and put them back into the vase. Dried flowers are very fragile so you want to treat them with care.